Earlier this year I braved the wintery cold of Romania and headed out to Brasov, the base of Oyster Worldwide’s activities in Eastern Europe and the home of our volunteering with kids projects. Despite having lived in Romania for 3 months during my gap year, I had never really delved into the world of volunteering with kids there. I needed to see for myself the hard work that our Oyster volunteers have been doing for the past 10 years. It is estimated that 60,000 children are in care in Romania at the moment. About 1000 more are abandoned each year due to rising financial pressures. The childcare system in Romania has improved dramatically over the past 20 years with international funding and charities helping to make sure that the kids in the system are properly cared for. However, there is a severe shortage of staff, and so the interaction, attention and affection that kids so need is often overlooked. Oyster volunteers’ roles are to fill this need, and to be a role model, help and friend to these kids. It was a really inspiring visit to see all of the childcare institutions that Oyster sends volunteers to. The kids were very happy, very eager to play, and even more keen to show off their English skills to me! Despite the hardships that they have gone through, the kids were very bright, sociable and above all, fun. It was great to get involved in their games and to simply teach them new ones. The fact that I spoke a bit of Romanian seemed to go a long way too, even though they found my accent hilarious. 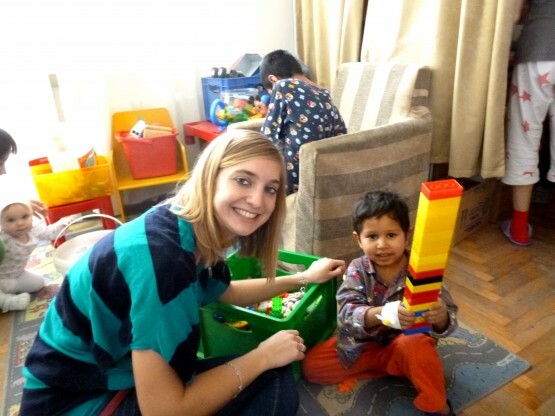 Oyster volunteers have been working in various orphanages, family homes, hospices, schools and nurseries over the last decade to bring love and affection into these children’s lives. The full time workers are stretched with time and resources, and so are working hard to provide for the kids’ practical well being. The volunteers can provide these kids with games, English help, laughter and the figure of a role model. Without volunteers, many of the kids wouldn’t be overly active, and volunteers are a great way to motivate these kids on. The range of childcare institutions that Oyster volunteers go to is really varied. Volunteers help out with orphans and kids with mental and physical disabilities, working with them to give them hope and a brighter future. I loved to visit all of these inspiring places, my only wish being that I could have stayed for longer! Why are there so many orphans in Romania? After WWII, Romania fell under the Iron Curtain of communism. As with many communist countries in this time, Romania started to run into economic problems in the 1970s. The dictator Nicolai Ceasescu was in charge of the country, and he decided that the answer to the economic problem was to create a larger workforce. A larger workforce would mean that more people would be able to work in the factories and on the fields, thus creating more food and wealth for the country. This decision meant that women were encouraged to have more and more children. Married couples under the age of 40 were penalised if they did not have more than 4 children, often receiving punishment, fewer rations and interrogations from the Securitate, the secret police. This policy became more extreme later on, when mothers under 45 were expected to have at least 5 children. Life was very hard in Romania at the time. There was not enough food to feed the current population, let alone all of the children that were being born. This meant that many mothers had to abandon their children to the state, and the number of children in orphanages sky rocketed in the 1980s. Many people will remember tragic footage on the news in the 1990s of the state of children in care in Romania when the dictatorship had fallen. Sadly, whilst these policies no longer exist, the effects can still be felt. The huge number of children that were abandoned to the state in the 1980s were not educated, and had no idea how to survive in the world. Many fell pregnant early on, and fed into the same circle of desolation. More children were left to the state to care for, and it is only now in the early 2000s that Romania is starting to recover from these disastrous policies.